Amazon has an awesome deal on organic jelly beans! Stock up now for Easter! 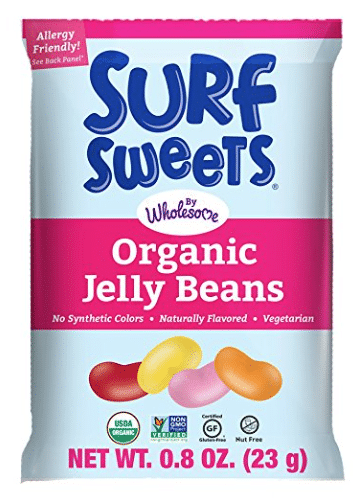 Clip this 20% off Surf Sweets candy coupon, then add Surf Sweets Organic Jelly Beans 0.8-Ounce, 96-Count to your cart. These little bags are the perfect size for Easter baskets (go in on the deal with a friend or family member if you need to). After the coupon, pay just $21.74 currently, so $.22 a bag! Or, choose Subscribe and Save for an extra 5-15% off, so as low as $17.67 for 96 bags, so just $.18 a bag! I’m hosting an Easter egg hunt, so I’m going to grab these on my next Subscribe and Save order and fill eggs with these jelly beans. You can’t beat the price per ounce on these, this is such a hot price. These jelly beans are allergy-friendly, organic, non-gmo and contain no artificial colors like regular jelly beans do. If you prefer to use this Surf Sweets coupon on other organic candy, just go here to check out the other products that qualify.